Thankfully Hurricane Joaquin tracked out into the Atlantic and didn’t hit Long Island with its full power. Even so, on Saturday the unrelenting rain and wind pelted us. With the Void Rally looming at the end of the week and the less than ideal weather, I opted to stay in all day Saturday during which time I tried to carve out a rally route. My route seems lame. I’m hoping for divine intervention by Tuesday night. If anyone has one of those red phones under glass with a direct line to the big man, could you put in a good word for me? When I got up on Sunday morning it was a relief to find that both the rain and wind had died away, leaving sunshine in their place. Deciding it was futile to continue to try whittle a route with my dull instrument, I opted to go for a ride instead. That’s usually good for snaking the clog in my brain drain. On top of needing to think clearly, I’ve got a bike to break in! As I followed along the north shore of the Island, I kept thinking about how miles feel different in different places. 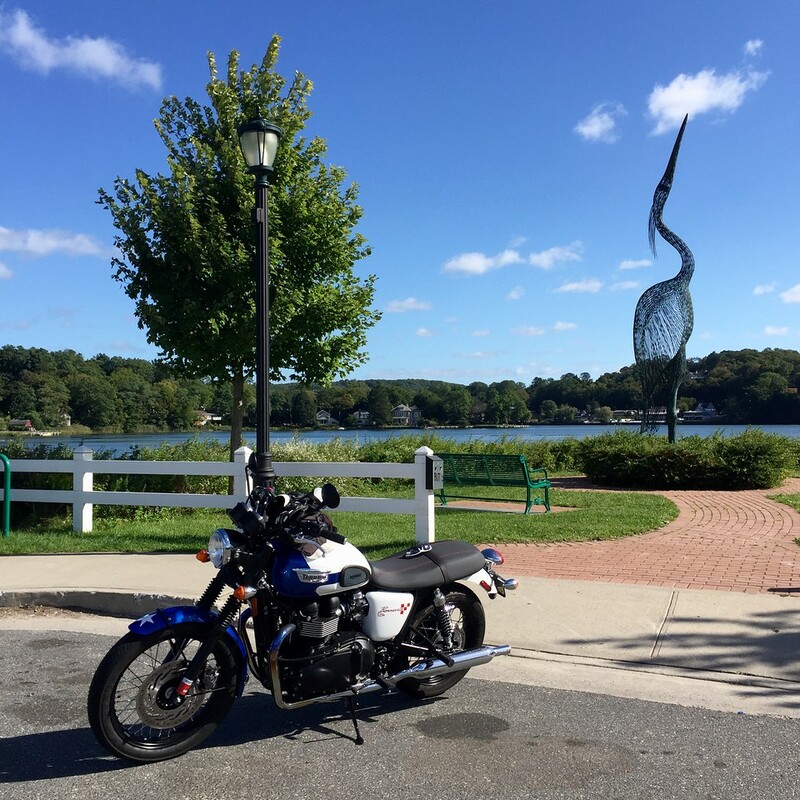 When you ride 25 miles on Long Island, it feels much different than when you ride 25 miles down the Blue Ridge Parkway or in Northern California or even the backroads in the Berkshires. I’m sure it comes down to familiarity, perspective and immersion in the environment. Being in a place that is “away” from where you live usually has a special polish to it. For me anyhow. Greener gras and all that. A new bike!? I guess I don’t pay enough attention. Kind of looks like a Bonneville. I think a new bike warrants lots of away time travelling beautiful twisty roads! Gorgeous Bonnie! That OTHER Guy From Metropolis? Maybe You’ve Heard of Him?